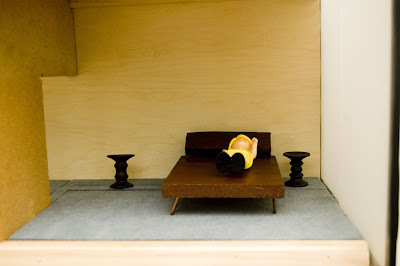 The Mies van der Rohe dollhouse | sweet juniper! 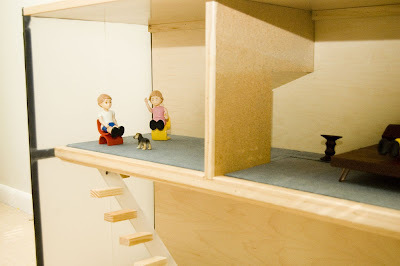 A long time ago I wrote a post lamenting the kind of dollhouses that were available on the market. At the time, Juniper wasn't even a year old, and things have gotten considerably better since then. 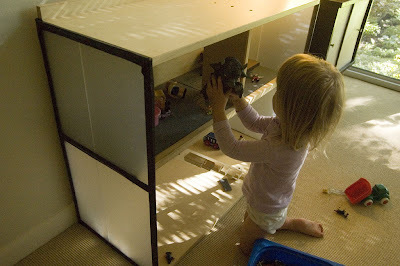 In that old post I vowed to build Juniper her own dollhouse, and ever since my wife's cruel revelation about the woeful cardboard vehicles I make for Juniper, I have felt a need to redeem myself in terms of what I am able to make with my hands. 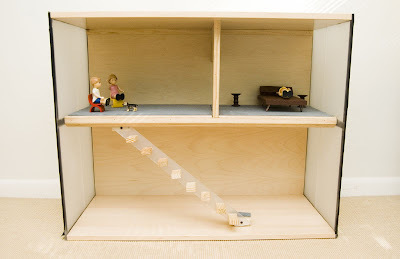 So I decided to build Juniper a dollhouse that resembled our own home, a Mies van der Rohe shoe box whose lack of any ornament would make the job extremely simple. The problem was, every time I visited one of those giant chain hardware stores, I would quickly grow intimidated and walk away before the guys in the smocks needled me into exposing my complete incompetence. All that talk about different kinds of saws really stresses me out. Besides, wood is freaking expensive. You'd think it didn't grow on trees. I am debating whether to make it look even more like our place on the outside, or just leave it kind of abstract and minimal. I am leaning towards the latter. 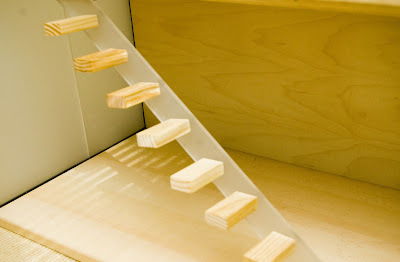 What I like about dollhouses is that they are spaces designed solely for a kid's imagination. She lands airplanes on the roof and lets Wild Things climb the stairs. I don't want to dictate any of the terms inside, or buy these chairs. She really wants a potty for it though, so I'll probably do what we did to decorate our real house: buy a whole bunch of cheap vintage stuff from the 70s and let her put the furniture wherever she wants to.